In the moment of time we have during execution of market performance – data flowing endlessly from all nodal points perscribed by our algorithms; here is ADOBE (NASDAQ:ADBE) – artistically designed and/or engineered using our CXQ Excel model to be calibrated with Marcoaxis – the Buy or Sell graphics. Sharpening the data’s focus in this case causes a slight distraction – to the viewer’s inner eye – But the essential kernel of information to which we direct your attention is the Call linear/logistic tracking blue line that rose away from the Put – up above it’s placement, simply implemented by the spreadsheet’s functionality. The pivotal inputs are Entry Price, Ask and Bid. 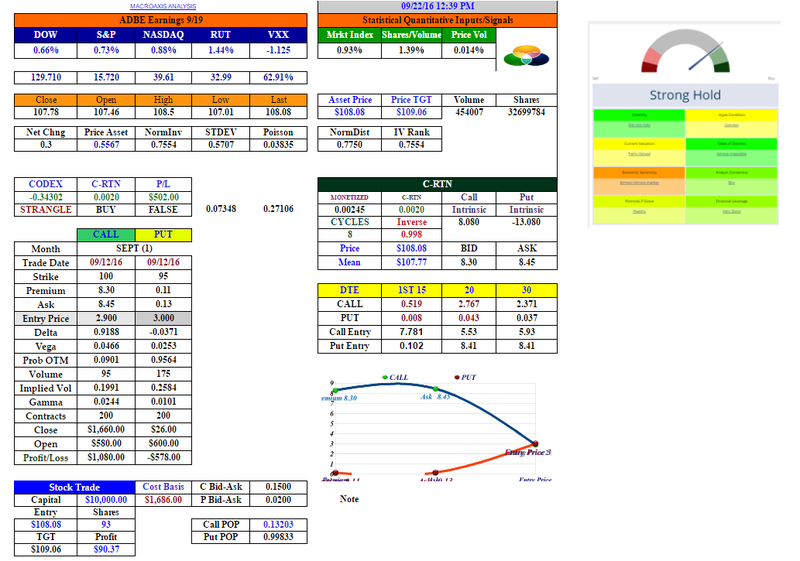 Volatility – DTE: Call Delta rose to 0.724; Put -0.036. Prob OTM for the Call dropped to 0.2929 while the Put Prob OTM rose to 0.9573. Next up – COSTCO September 28th. As with all our posts they are strictly educational. We are grateful for Macroaxis’ assistance in providing their robust Financial Analytics. (The graph posted on the right. This is a “cut-to-the-chase” solution oriented task to find out if your chosen golden asset is volatile enough to make it a profitable option choice and what is its correlation to similar assets within its sector/classification? Take the past history of the “asset” for the last 40 days (it’s metaphysical) from Google or Yahoo finance’s prices. Next to the price column, starting on the second cell below the first price, put in the Excel =stdev(First Price;Second Price) formula. Fill out the remaining cells to obtain the standard deviations. Take the “Line Graph” and use “Lines Only”. Fill in the graph with the STDEV outcomes. Here’s an example comparison between AAPL and IBM. The blue line is AAPL and IBM is the orange line. My take away is that IBM and AAPL would be a good selection for a portfolio. Why? They are diversified enough as you can see, they nearly move in opposite directions that translates into protecting your asset allocated profits. IBM surprisingly to me is more volatile so there might be more option premium volatility versus AAPL. This is something I’ll need to look into. Meanwhile, keep the excel spreadsheet handy. You can check just one asset to get a reality check on its percentage moves and volatility characteristics that will save you a lot of headache in tying up your occurrences with marginal volatility. Cut-to-the-Chase Formula for Long Call/Put Analysis. Note: Credit goes to Tom Sosnoff and his brilliant staff at Tastytrade/Dough for the initial presentation of this options trading methodology. I have tweaked it a bit only as a means to augment the fundamental inputs. We present a qualified simple formula to reduce your limit price entry cost. We’ve posted our excel spreadsheet data to show how it works. The key to our work is “transparency” with the exchanges Bid/Ask pricing – e.g. BATS has laggard price formations versus, say NASDAQ. 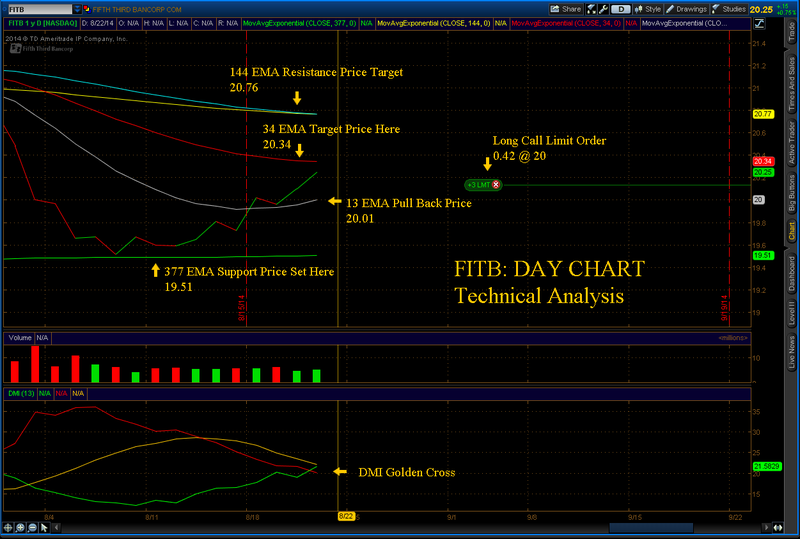 For tomorrow, we’ve set up a SEPT (21) Limit Entry Long Call for FITB. This is based on our preliminary scan – from our proprietary NQ2 model. “Limit Entry” is a proprietary calculation that we use to reduce our cost basis – anticipating what is most likely the pull back premium price for tomorrow’s opening – typically during the first hour. This is so we capture (most times) a profitable position and/or set up a “buffer” or “risk aversion” entry. The “TGT P” is the calculated Target Price based on the underlying liquidity. 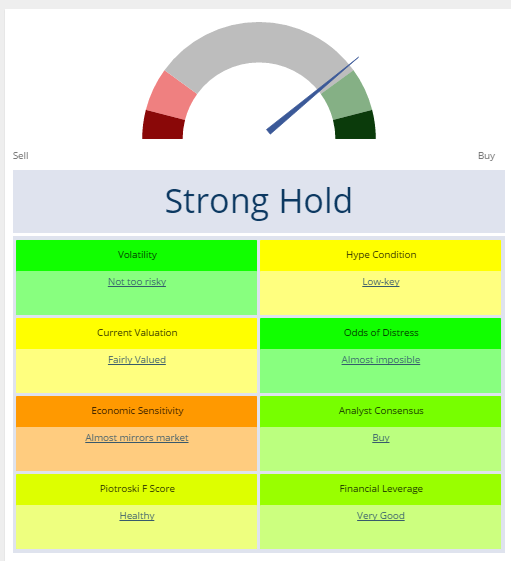 This will change during the day, but it gives us something to shot for and moreover to compare to the chart for technical moving averages overlay price levels. “Cost” is our initial capitalization and “Close” is what the amount gained. Our potential profit is $75.75, having taken out our commission fees. We calculated our risk aversion cost (not shown here) to be $17.33. 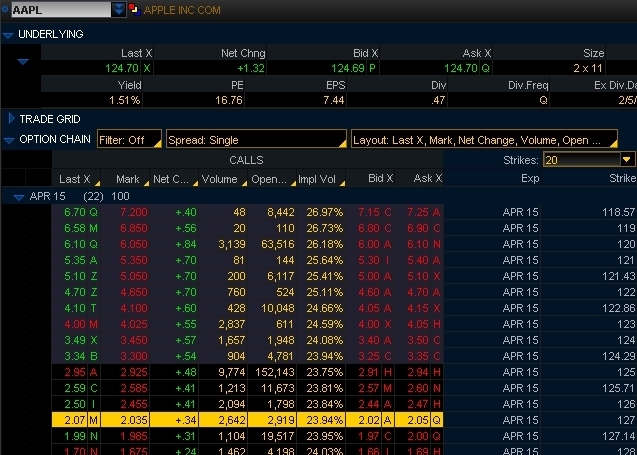 The Call Ask/Bid spread is 0.4 (four cents); whereas the Put spread is currently .11 (11 cents). The “TREND” is determined by the current price compared to the “OPEN” price when the market opened for the day. The “IV SIGNAL” is a calibrated formula using Implied and Probability statistical equations to determine which side of the assets option chain to lean into. We’re searching for “robust” Long Calls. Robust is defined as being above average in performance that moves individually from the overall market performance. *We are writing this “after hours” when the market is closed. Thus, the “Liquidity” is skewed because the necessary input parameters are not operating within the intraday activity – correlated to the market indexes performance. Taking the “underlying asset” into account, below is our data inputs and parameters to watch for validation, continuation of our chosen directional move and/or a pending reversal. The “Price H/L” price is above is a positive sign that the price will continue upwards. The “Average” is the Mean, and the “Offset” is a calibration from our formula set; similar to One Standard Deviation of the underlying price. Currently, this is above the “Last” price that validates the probability of a profitable Long Call. This price will drop below the “Last” during intraday trading. The key is to the number of occurrences that occur; that signal a continuation of the Trend, or a soon to come reversal. (If we notice a “Flash” with this price – that is a “ping” that causes an anomaly of the price range, than it’s a signal that High Frequency Traders are testing the market to “bait” Institutional investors into unloading large inventory orders. That brings us to the “Decay”. This is rather ingenious: a hybrid calibration of Time Decay and Duration formulas. Right now, with the market closed it is a high percentage, because it is tied to the Bid and Ask spread of the underlying asset. What we ideally are looking for is a value around .25% to .45%. Moreover, what is not shown here is our NQ2 Greeks – the Alpha, Beta, Sigma and Omega value parameters that validated FITB to invest in with a Long Call option. The Line Trend has bounced off of the 377 EMA (Green Line) going upwards toward the 34 EMA (Red Line) having crossed over the 13 EMA (White Line). Above this is the 144 EMA (Yellow Line), tied in the 89 EMA (Blue Line). There are not Binary Events posted (Earnings or Dividends). The 377 EMA has set the Support Price Level at 19.51; 34 EMA Price is 20.37 – about 0.10 above the current “close” price of the day 20.25. This gives us some breadth for more upward movement. The 34 EMA (Red Line) can become the Resistance Price, which we will watch for during tomorrow’s session. Above this is the 144 EMA and 89 EMA that set the farthest out Resistance price at 20.77. 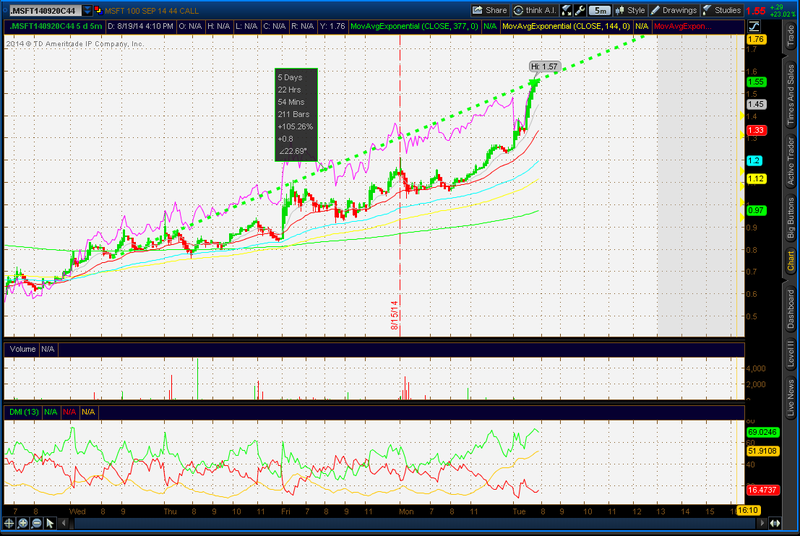 The 13 EMA (White Line) is at 20.01. Taking a look at our “Equity” block – the Average Price is 20.13 that falls within our “Price H/L of 20.51 and 19.99. Our “Offset” is 20.30, close to the 34 EMA price at 20.37, so we still have a playing field for a scalp play, if necessary. The DMI oscillator shows the beginning of a Golden Cross – Bullish Signal. Lastly, that “Green Oval” on the chart is our Long Call Limit Entry Order position, right between the 34 EMA and 13 EMA. With the 144 EMA gapping above the 377 EMA, there is a consolidation of price forming. With the sufficient drop back on July 16 – we’re over a 30 day window – coming into the final 15 days of our 45 day time horizon. So, we’re coming in on the tail end of the price volatility, before a new directional pattern forms. ** In consideration of Nodes and Edges physics, we are working on a new math formula that is based on quasicrystal formularies – addressing Hilbert’s 13th Problem. This is mainly to prepare for the Quantum Computers programming that takes the binary code and translates it into “Qudits”. 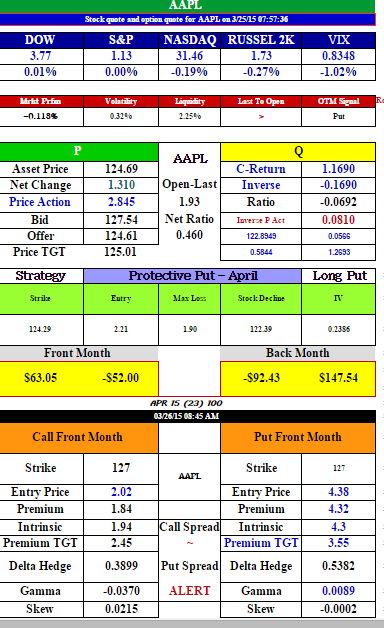 For C-RTN price entry, we take the At-the-Money Strike Price for our chosen option month (10 to 45 days out). The “Context” is Out-of-the-Money (OTM) and “In-the-Money” (ITM). We want the ITM value that is larger than the OTM comparatively 0.59 to – 0.73. The Intrinsic Value is calculated based on the “Monetized” formula, and below this “MON VALUE” is the high and low price range during intraday trading. 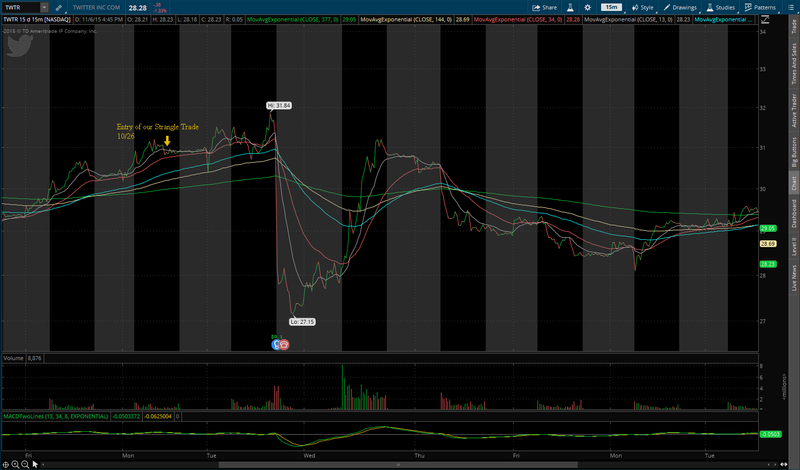 For Example here is a NFLX set up we did earlier this week. NFLX $468.58 (We’ll take the SEPT (31) Option Chain @ $470 Strike since NFLX shows a robust trend upwards. You’re Take Away is that NFLX has a higher probability of profit if you Buy a Long Call entering ATM. We used the 470 Strike Price. Next: Reducing your Cost Basis with a solid Limit Entry Price order. Generally speaking, once you purchase a Premium, you’ll lose 1/3rd of the value. Within 15 days the premium decay is another 3rd. Empirical data shows that 45 days seems to be the bell curve peak for a probability of profit outcome, or when you would considering taking your profits off the table, if you haven’t already. A simple way with a robust outcome is to divide the at the strike Ask premium price by 16. For confirmation we calculate the Limit Price difference from the Premium to the underlying price on the chart at 15mins – to determine if the pull back is feasible to take the limit price. The square root of 252 trading days is 16, thus the use of 16ths that is correlative to any other TC method’s outcome. The NFLX Limit Order Entry was 11.07 to BUY a SEPT (31) LONG CALL @ 470; x2 Contracts. Our profit $664.00. Note: We use a hybrid Time Decay Formula calibrated to ‘Duration’ that provides an explicate outcome. At the time of our trade it was .24%. Using our NQ2 Model, we identified MSFT as a robust LONG CALL option play – SEPT at the Strike price of 44.00. This is solely based on the data posted below. The matrix below displays our current trade that was entered on a Limit Entry @0.95 on 8/15/14. The strength signal is based on the Covered Return – shown below under Derivatives. What is important to note here is the Ask-Bid spread and the “C PROB” (Call Probability) that is a calibration of the Implied Volatility formulary set. The chart shows the “robust” trend that was identified by our model’s calibrated formula set. The data box shows the trend to be at 96 Bars with +105.26% increase at an upward slope of 15.32 degrees. Liquidity is key to both price momentum and the Bid/Ask spread. Thus our model provides us with the most accurate Liquidity percentage validated by the “TREND” and “IV SIGNAL”. What we’re looking at here is primarily the Covered Return Ratio to the Inverse. Currently at .77, this means a Long Call will remain robust. If the Inverse would start to shift upwards, that would be a signal that the premium is going to start to fade, out of our favor. Thus, we’d close the position. Since we know that derivative positions can go against us very quickly, this signal is vitally important in keeping an eye on our profitability. The Option Call/Put price data is real time – and not reflective of our trade, which is posted at the beginning of this blog. We closed our position at 1.54; +0.58 profit, having held this open for 4 days. *The TARGET PRICE is hypothetical. It provides us what we call the LIMIT ORDER – or highest price possible for this particular option premium. Other factors come into play, especially Time Decay. You will note that we provide the Time Decay in our analysis – the lower the number the more robust the trade will be. It’s a recipe of quantum physics mixed in with some quantitative calibrations integrated with statistical valuations – all calibrated upon the advanced new mathematics of “nodes and edges” in fractal quasicrystal research. We’re looking into the future of Quantum Computers – based on the latest news that the binary code of 1’s and 0’s will be translated into the “Qudit” via a new and improved silicon chip will be programmed. Fundamentally, the data inputs and parameters are going to dramatically change. Meanwhile, we’ve re-calibrated our excel spreadsheet nodes and edges to post some insights. Derivatives: The data posted is a snapshot of the intraday trading movement; providing the most important signals for discretionary trading of the equity option chain. Liquidity ought to be .50% or higher for greater price movement; Trend determines whether to lean into the Call or Put side. Implied Volatility (IV) Signal is formulated by a number of statistical volatility and probability inputs. Notable is the “Offset” and “Decay”. Offset is a determinate of what the book order price is currently at and the Decay is a “Duration” calibration to Time Decay. The lower the number the more favorable will be the outcome for a Call position and vice versa. Price High/Low is the range that can be attained during intraday trading. The far right price is the Harmonic Mean price. The above post shows the Covered Call Return percentage. The higher the far left number is to the Inverse, the probability of maintaining a profitable Call will be attained. This is based on the Strike Ask premium. We post two months – which is SEPT (35) and NOV (98) hypothetical outcomes – based on a calculated Limit Entry Price. The Limit Entry Price is calibrated from the Time Decay equation.